It's been one of the nicest falls of our 13 years in Teton Valley. Snow one weekend, sunshine the next, temperatures perfect. 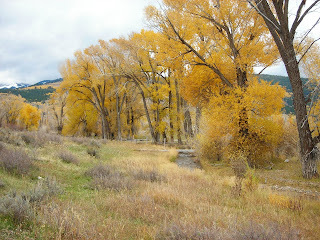 And, while they're essentially gone now, the colors were brilliant. A genuine Indian Summer, relished by all. The 4" of snow from ten days ago was a distant memory this week. 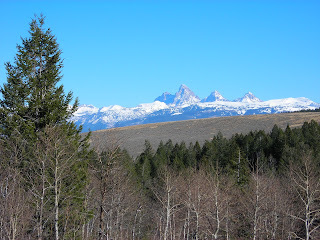 Brilliant blue sky framed snow-covered Tetons, and it was good to be living in Driggs. I made it out on two afternoon mountain bike rides, both in short sleeves and shorts...nearly unheard of for late October. 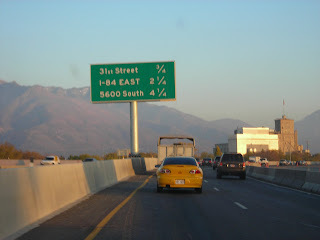 I somehow pried myself away from Driggs bliss, and drove to Salt Lake for yet another R.U. Outside tradeshow. As a Wasatch Front native, I don't mind occasional return visits. It's always good to reconnect with family, friends and familiar places. I even spent a night with my good friend Matt Z and his impressive young family (loved the steam shower!). The show was good and so was the company. But, the explosion of traffic, construction and smog from Ogden to Provo these past few years has made it almost intolerable for a small town Idaho boy to handle. When I was a young lad, Draper was where you went to pheasant hunt; today, it's nothing but trendy strip malls, subdivisions and pavement. I was happy to flee back north in time for Sunday in Driggs. 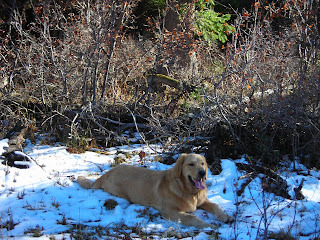 Bridger accompanied me on one of the afternoon rides last week, and was thrilled to find some lingering snow in the shade. I promised him there's plenty more white stuff on the way, soon. There is a recall election pending in Teton County, and it's consuming the community. The weekly newspaper is filled with letters supporting or opposing it; we're getting phone calls at home every week encouraging us to vote one way or another; today I was at the local gym, and someone I didn't know asked me whether Joanne and I were "for" or "against" the recall...before he even introduced himself. It's an issue that's getting more attention than the elk hunt this year, further illustrating the degree of change in Teton Valley. Two new commissioners were elected in last year's election. They won, fair and square. Both happened to be Democrats, one male and one female (gasp!). It marked a sea-change in the valley towards more liberal leadership, and many long-time locals were not happy about it. Enough of them (over 20%) signed a petition to force a recall election So, here we are, election deja vu all over again. 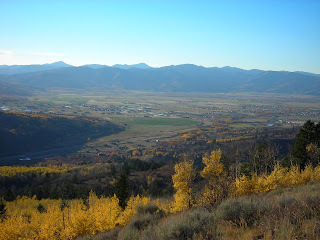 On November 7, we the citizens of Teton County, Idaho will vote either FOR or AGAINST an actual recall. If the number of FOR votes is greater than the number of votes these commissioners received in last year's election, they will be replaced by two other Democrats selected by a complex committee and state system. I wonder whether those who signed the "recall petition" even realized what the process would entail. Regardless of the outcome, they will not have Republican commissioners during the course of this term. This all reminds me of my senior year in college, when I served as a "research and writing intern" for Utah Senator Jake Garn on Capitol Hill in Washington, D.C. I went in thinking I would make a career of politics in some form or fashion, possibly even staying in D.C. after the internship. I left swearing it off for life, disillusioned by a system that worked smoothly two-hundred years ago but has since become long on process and short on results. I respect those who do it (especially their patience), but it just wasn't me. Realizing I was much more of an entrepreneurial personality, I started a small business shortly thereafter and haven't looked back. Speaking of my business: it's tradeshow season, and last week was Seattle (the show was actually closer to Tacoma, but Seattle sounds better). We sent Andrew and Kurt up from Logan with the truck & trailer - loaded with inventory - and setup a 600 sq. ft. booth. We basically operated a portable store for 2 days selling R.U. Outside boots, gloves, socks, long johns, fleecewear, jackets, headwear and accessories. All the good stuff you need for winter. It's a lot of work and brutal on the feet and back, but worth it. Anchoring our team were three generations of Lloyds, all of them Washington natives: the legendary Kay (a.k.a. 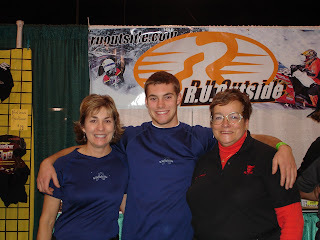 "K-Dog"), her daughter Jana and grandson Anthony. Great people, and Anthony showed he's ready to carry the family salesmanship torch forward. 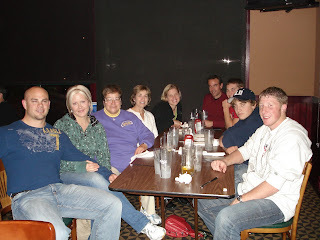 We had a large, fun, effective staff...and no drama! Always a bonus. 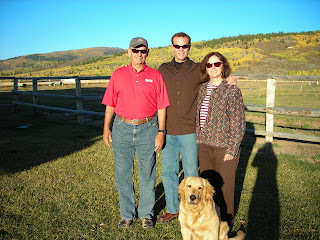 Nicole flew up from Colorado, plus my younger-bigger brother Mark and his wife Annie came from Salt Lake. They are awesome to hang out with. We went to dinner in the hip Belltown district of downtown Seattle Saturday night, enjoyed great food and gawked at big city life. I'd post a picture of something cool like the Space Needle or Mount Rainier, but it was raining the entire time. 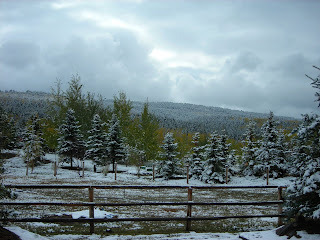 As we continue to bounce between winter and Indian Summer here in Driggs, I see analagous transitions all around me. Long-standing Teton Valley ranching and farming vocations are fading, transitioning to a new recreation-based economy. When we arrived in 1995, the local scene was all about those traditional pursuits; school was even stopped for a week so the kids could work the potato harvest. Today, kids and faculty still get "Spud Week," but most of them use it for vacations. 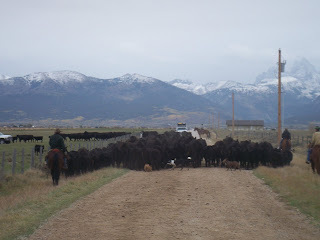 Cattle drives are still seen, but are viewed with nostalgia. In those same twelve years, I've seen the local equine scene transition from an every-man pursuit to a more privileged activity. The younger generations now use ATV's to get around on the farms and backroads. Joanne frequently comments, sadly, on how her circle of riding friends has dwindled. 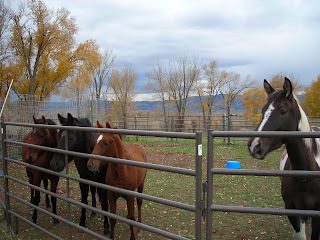 Horses require daily work and feeding; ATV's usually don't. Plus, horses require open space, which is disappearing by the day. I find myself nodding more and more respectfully to the so-called "old timers" when I see them around town, or pass them on the few remaining stretches of Teton Valley rural roads. I simply can't imagine the scope of change they've witnessed in their lifetimes here, it's gotta be staggering. When we moved to the valley, there was an unnamed and very faint horse trail that snaked back into the Big Hole mountains, just west of Pine Creek Pass. In 1996, Joanne and her friend Celia started calling it "Spooky Trail," because it often felt sort of creepy along the way (that spookiness was verified a few years later, when I encountered a mountain lion about a mile from the trailhead...and confirmed again later when I was surrounded by five Great Pyrenees sheep dogs and thought my days had ended). The trail was eventually adopted by the Forest Service, and is now called "Spooky Trail" on official maps. Pretty cool. From those lonely and spooky beginnings, to how the trailhead looked today. 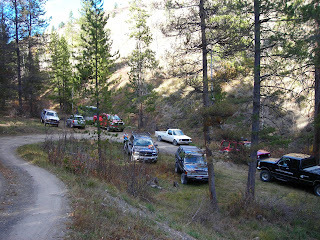 To be fair, our trails are always more crowded during hunting season, which is in full swing at the moment. Nonetheless, this scene was further evidence of the transitions that come with growth. And, apparently, if you name it...they will come. Perhaps the most abrupt transition of the week was experienced by our dog Bridger. At 7 months and 77 lbs., he graduated from the ranks of "young stud" to "it." 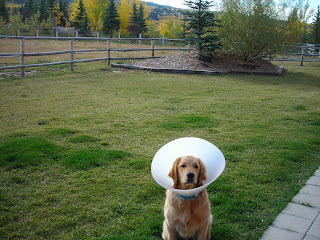 To keep him from removing his own stitches, he was a conehead for a couple of days, which he took as a mere bump in the road. Can't say I would have handled it that well ;-) He's already game for new adventures, more worry-free than ever. 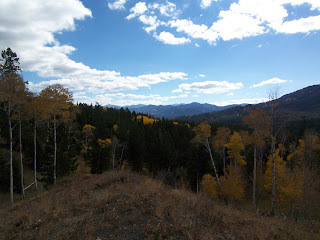 Fall has many faces here in Driggs, and you can easily see several of them in a single week. Ten days ago was perhaps the nicest fall day we've had this year, with temperatures in the 70's, colors vibrant and not a cloud around; two days later it was snowing and blowing; the next day was 60 and sunny again; two days later we were back to snow...and so on. My parents typically visit in late September-early October, and they often joke about experiencing three seasons in a week. This year was a case in point, but they roll with the weather and are always in good spirits. They take long morning walks, ride the bike paths in Jackson, drink huckleberry shakes, visit Teton Park to see (and hear) elk bugling in the evenings, and enjoy the baseball playoffs on t.v. at night. Baseball is a religion in our family. Joanne and I enjoy having family and friends visit for many reasons, one of the main being that fresh eyes truly see the surroundings. We might sometimes take our Teton scenery for granted, but visitors notice every detail, and it rubs off in a very good way. It was great to catch up with mom and dad. 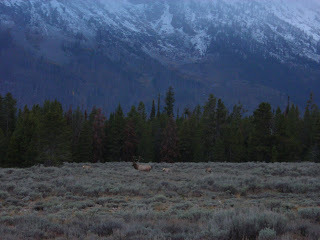 We joined my folks one evening in Teton Park, immersing ourselves in the sights and sounds of elk in the rut. Their bugling strikes a primordial chord, a feeling I wish everyone could experience sometime in their lives. The evening culminated with dinner at the Silver Dollar in Jackson, listening to cowboys and hunting outfitters' tales at the tables around us. I kept expecting Bill Townsend to walk in. He is missed. 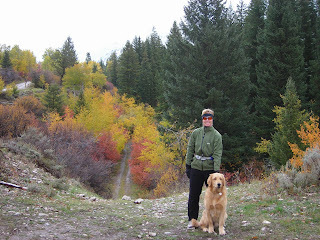 Bridger loves the cooler weather and snow, but Joanne and I are hoping for a couple more weeks of Indian Summer weather. 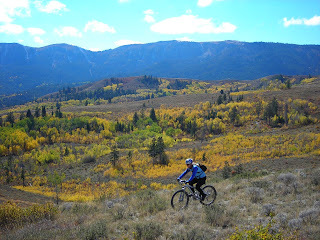 The mountain bikes aren't yet ready for hibernation. Meanwhile, I'm predicting a Colorado-Cleveland World Series (hey, it's October...where's A-Rod?). World-class snowmobiling, skiing, fishing, farming, golfing, boating, mountain biking, horseback riding, hiking, photography...and relaxation, at last. 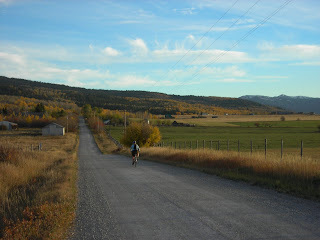 Outdoor enthusiast; midlife crisis survivor; asphalt sales & marketing; cyclist, triathlete; nearly two decades here in beautiful Teton Valley, Idaho.